As a gift to Trib readers this holiday week, we're pleased to reprint Calvin Trillin's New Yorker profile of 1972 Democratic gubernatorial candidate Frances "Sissy" Farenthold — one of a dozen and a half articles and poems that will be published early next year in Trillin on Texas, a new anthology from the University of Texas Press. A staff writer at the magazine since 1963, Trillin has long seen the state as a rich source of material; elsewhere in the anthology are meditations on subjects ranging from Texas barebecue to the fictional film critic Joe Bob Briggs. He also considers Texas to be a part of his ancestral narrative, as several members of his family arrived in the United States by way of Galveston. "Yes, I do have a Texas connection," he writes in the introduction to the anthology, "but, as we'd say in the Midwest, where I grew up, not so's you'd know it." It is customary for any woman in politics who is against the established regime to be called feisty, more or less the way any elderly black sharecropper whose picture is taken by a magazine photographer is spoken of as having great dignity. Frances (Sissy) Farenthold, a state legislator from Corpus Christi who just lost a runoff for the Democratic gubernatorial nomination in Texas, was occasionally called feisty during the campaign by some visiting reporter, but the Texas Observer — a liberal Austin biweekly that happens to have as its principal editors two women who are sometimes called feisty themselves — titled its cover story on her last year “A Melancholy Rebel.” When Mrs. Farenthold said during the campaign that a “private government” of special interests controls the state capitol, she seemed to be expressing disappointment even more than anger. Her voice often had a tone of weary resignation, as if nothing would please her more than to hear that everyone in Austin had reformed and thus relieved her of the unpleasant duty of dealing once more with a tiresome subject. When asked about her mood by reporters, Mrs. Farenthold sometimes said it derived partly from her experiences during the two years she served as director of a legal-services program in her home county, just before her election to the Texas House of Representatives. An alternate theory is that anybody who has seriously worked for change through three sessions of the Texas House of Representatives is fortunate to escape with a melancholy frame of mind instead of severe, disabling depression. Mrs. Farenthold went to Austin in 1968 with the idea of working for welfare reform — having come to the conclusion that the welfare laws had a lot to do with the pathetic condition of her clients in Nueces County — but she eventually became identified with reform of the state government itself. The Sharpstown stock-fraud scandal — a complicated series of events tied together by the passage of some banking legislation and the stock profits of some people who were helpful in passing it — made corruption the most important issue in Texas politics during her second term in the House. Normally, officeholders in a state like Texas have differed from eminent public servants in the federal government primarily in the way some social scientists claim that lower-class Americans differ from those Americans who have arrived at the middle class — an inability to defer reward. A commissioner of an important federal regulatory agency is content to live on his government salary, secure in the knowledge that his next job may be as a highly paid executive or counsel in the industry he has been regulating. Distinguished Washington lawyers who serve as deputy secretaries of one department or another are ordinarily not given large retainers to use their influence until after they resign their posts. In some states, though, it is understood that such patience is too much to ask of a poor frail human being who happens to find himself governor. In Texas, participatory democracy has meant that leading Democrats can participate in the most lucrative business deals. During her campaign for governor, Mrs. Farenthold would sometimes ask her audience, “How long has it been since we’ve had a governor who left office without a ranch?” When Orval Faubus left the governorship of Arkansas, he was asked how he had managed to build a two-hundred-thousand-dollar house after having earned only ten thousand dollars a year during his twelve years in office, and he said he owed it all to thrift. What brought Sissy Farenthold to prominence was that the Sharpstown scandal was blatant enough to offend the voters but not the Legislature. In the House, Mrs. Farenthold’s resolution calling for an independent committee to investigate the scandal drew the support of only thirty out of a hundred and fifty members — a group that became known in Austin as the Dirty Thirty. But it soon became obvious that even Texans who are relatively tolerant about how the temptations of high public office might strain a man’s patience were shocked by the Sharpstown disclosures. Voters never seem shocked at hearing about the impersonal forces that actually control a state government. Nobody seemed surprised during the campaign, for instance, at Mrs. Farenthold’s disclosure that there were a hundred and seventeen utility lobbyists registered at the last session of the Texas Legislature and that Texas remains one of the few states in the country without statewide regulation of utility rates. Candidates for governorships around the country rarely bother to bring up the fact that the state regulatory agencies that do exist are often controlled by the industry they are supposedly regulating. (When Mississippi’s insurance commission authorized a rate increase after Hurricane Camille, the commission consisted of two insurance agents and a lawyer for insurance companies.) But personal corruption can make voters angry. In Texas, there has been much more interest in how relatives of some legislators managed to end up on the payroll of other legislators than in how Texas manages to remain one of the four states in the union without a corporate income tax. When the governor of Texas, Preston Smith, who profited personally in some stock transactions connected with the Sharpstown case, decided to run for renomination in the Democratic primary this spring anyway, he was given little chance of success. Dolph Briscoe, a millionaire banker and rancher from Uvalde, who had finished fourth after an expensive campaign for the nomination in 1968, was considered a strong candidate, partly because he could prove that he was innocently banking and ranching in Uvalde when everybody was trading stock in Austin, his only state-government service having been as a legislator in the fifties. The favorite in the primary was Ben Barnes, the lieutenant governor, who had not been directly involved in the Sharpstown transactions, although, as David Broder of the Washington Post pointed out, all the talk about the number of investigations that had failed to link him with the scheme made him sound uncomfortably similar to Big Jule in “Guys and Dolls,” who was renowned for having had thirty-three arrests, no convictions. (In the financial statement required of gubernatorial candidates, Barnes stated that he had two hundred and sixty-seven thousand dollars in assets — which, for a young man who had spent his entire career as a public servant at a salary even below that of the governor of Arkansas, displayed a degree of thrift that approached asceticism.) In winning the lieutenant governorship, Barnes, a protégé of Lyndon Johnson and John Connally, had carried every single one of the two hundred and fifty-four counties in Texas. His political rise was considered so inevitable that the two sides of a late-night political discussion about him in Austin could be divided by differing opinions on precisely which year he would become President of the United States. The candidacy of Frances Farenthold seemed barely able to survive a description of who she was — a politically liberal woman who was called Sissy and had gone to Vassar and was married to a foreigner. (George Farenthold is a businessman who was born in Belgium and has been an American citizen since 1940. The George Farenthold, Jr., who was found murdered last week was his son by a previous marriage.) She was dismissed by all professional politicians as a token candidate who had absolutely no chance of making the runoff. In Austin, she was known for holding strong views and expressing them — which in the way professional politicians judge candidates for statewide office is like having a serious disease and developing complications. In 1969, a resolution commending Lyndon Johnson for his handling of the Presidency, including, presumably, his handling of the war in Vietnam, had divided the Texas House along strictly male-female lines — a hundred and forty-nine for, one opposed. Among all the legislators who believed that sooner or later there had to be a change in the Texas marijuana law, which now makes possession of marijuana a felony that can be punished by life imprisonment, Mrs. Farenthold was the one willing to become identified as an advocate of pot by introducing a bill that would have made first-offense possession a misdemeanor. She openly supported the farm workers’ boycott of lettuce and refused to join the other candidates in reciting the dread effects of school busing. Early in the campaign, she called for the abolition of the Texas Rangers — an élite corps of the state police that many Texas Anglos think of as a symbol of proud Texas history and many Mexican-Americans in the southern part of the state think of as a symbol of Anglo oppression. (She later said she would settle for making South Texas off-limits to the Rangers.) Her supporters could think of hardly anything else she could do to offend the type of voters Texas candidates ordinarily cultivate, except, perhaps, to launch a vitriolic personal attack on John Wayne. But her most important identification was still as someone who had fought the corruption in Austin rather than tolerated it — the Den Mother of the Dirty Thirty. Dolph Briscoe, advertising that he was a man Texans could believe in, got forty-four per cent of the votes, almost winning the primary without a runoff. But Sissy Farenthold finished second, eliminating both the incumbent governor and the incumbent lieutenant governor from the race. Whether the simple fact of being a woman gained or lost votes for Sissy Farenthold was a popular subject for discussion after the primary — the primary results having relieved the discussants of the burden of arguing about which year Ben Barnes would be President. There was some question whether a woman candidate was culturally unacceptable to a lot of Mexican-Americans or to those Texas Anglos whose idea of a public leader is the father of the Cartwrights on horseback. There was some question whether middle-class Anglo women found her a source of pride or envy. She had, after all, lived what might be the fantasy of any housewife who felt unfulfilled by the League of Women Voters: a lawyer from a family long prominent in Texas law, she had waited until her youngest child was in school before taking up full-time practice, and seven years later had found herself as a candidate for governor. There were those who believed that her unusually strong primary vote in normally conservative suburbs reflected the support of women, although other analysts traced it to simple snob appeal. Despite their reputation for being embattled, liberals in Texas are not just a tiny minority, as they would be in, say, Mississippi. When their traditional coalition of labor and the minorities and ideological liberals is operating, they can carry the state — which hasn’t happened in the governor’s race for many years but has accounted for the election of Ralph Yarborough to the Senate a few times. The two or three people who told Sissy Farenthold that she had a chance of making the runoff based their prediction not on her appeal as a reformer but on what they called a “structural opportunity” — a number of liberal votes that no other candidate was likely to get. She went into the runoff without the official endorsement of the state labor organization and without assurance of a large turnout of black and Mexican-American voters. But her advisers hoped she could make up the difference with the support of young voters and women and, most of all, people of all sorts of backgrounds who were disgusted with the state government and wanted reform. It is routine for Texas-candidates who can be labelled liberals to assure voters that old labels like “liberal” and “conservative” are meaningless. Mrs. Farenthold managed to sound more persuasive than most, partly because of her approach — she seemed to be considering each issue separately rather than fitting it into some ideological framework — and partly because of the issue that brought her to prominence. Although the Dirty Thirty had included the liberal faction in the House, it had also included some Democrats who were not liberals and even some Republicans. 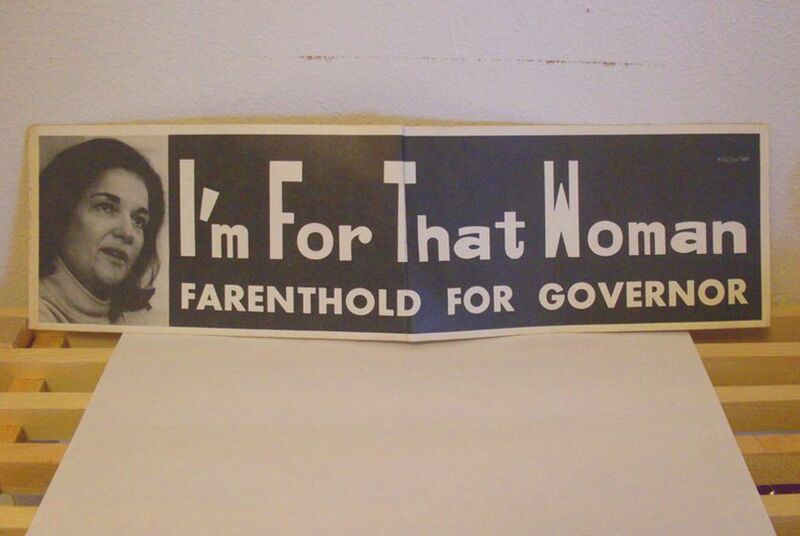 Mrs. Farenthold, campaigning as a reformer rather than a liberal, maintained that the issue of the campaign was public government versus private government rather than liberal versus conservative. Compared to what she was accused of believing about marijuana and busing and abortion, her concentration on the need to end favoritism and bring honest representation to Austin sometimes sounded like a respectable, middle-class appeal for good government. But if public government actually ever did replace private government in Austin — if, as Mrs. Farenthold suggested, the lobbyists were reduced to the role of petitioners rather than manipulators — the result would have been the “radical upheaval” Briscoe accused Mrs. Farenthold of favoring. The manipulators she was talking about represent the most powerful financial interests in the state. What the Democrats who have always defeated the liberals in statewide races have had in common is not a rigid political ideology — a number of them, including Ben Barnes, are noted for their flexibility — but a compassion for the plight of people who have to wake up every morning and face the problems of running an oil company or a bank or a utility. From TRILLIN ON TEXAS by Calvin Trillin, Copyright (c) 2011. Courtesy of the University of Texas Press.